While Jonathan Caouette has already gotten good buzz for having made this Sundance favorite using old photos, film from various cameras, and answering machine tapes – and spending just $218 to assemble his footage, edit it exclusively with iMovie, a free video-editing software package, and burn it onto a DVD. It doesn’t hurt that the executive producers on this film are indie-film giants Gus Van Sant (Elephant, Good Will Hunting) and John Cameron Mitchell (of Hedwig and the Angry Inch fame). But the true magic of his autobiographical film Tarnation is in its intimate revelations of the sweetness amidst the damage of life, and in the filmmaker’s willingness to give himself fully to the monumental task of exploring his developing self and surroundings on film. Tarnation is Jonathan Caouette’s collected family memories, fragments of songs, ideas, and photographs, and the portrait of a young man’s discovery of film itself as a saving grace. 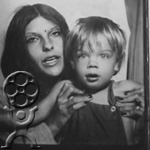 Film is where Jonathan poured his yearnings to interpret what he was seeing and feeling, his gender identity questions, and his massive confusion about which parts of his family’s madness are his to inherit and what are owed to the forces of alcohol, tobacco, drugs, poverty, and stress. For Jonathan, his family is a source of pain and terror at the same time that it gives him an anchor, a home, love, and a place of silly joy. Despite all the abuse and tragedy fate has heaped upon his family, in Tarnation, his eye finds the flow of love between the members of this strange tribe, each all each other has. In one painfully emblematic scene, his grandmother hacks, giggles, and rasps, “I got TB — tobacco and beer!” The haggard, snaggle-toothed woman cracks herself up, showing just how far gone she is on her favorite vices, but also how her own sense of humor gives her joy. In assembling these memories into a narrative, Caouette reveals his strength at editing to find moments of rare beauty in apparently desolate landscapes. Tarnation opens with a seductive title sequence that intersperses clips of his childhood hometown and family on film with shots from a train streaking along track and a spare folk tune yearning behind them. Jonathan’s style allows his mother’s tentative, goofy smile and sense of humor to surface and shine. Cut to 2002, when Jonathan, is in New York, rolls out of bed and looks up “lithium overdose” on the web. The camera fills with his collapsing face as he talks with his mother’s doctor about her overdose and her likely prospects, which include brain damage and kidney failure. He takes a train back to his Texas hometown and plunges into the present and past calamities that have brought him here. This is not the first sudden downturn in the history of Jonathan’s mother. Renee LeBlanc was a great beauty as a child, posing for ads and featured in teen magazines. When she was 12, however, Renee fell off her roof, landed on her legs without bending her knees, and was paralyzed for about 6 months. Her doctors and parents decided her paralysis “was all in her head” and gave her shock treatments twice a week for two years. Jonathan tells much of his family’s story in blank screens or still photos with titles of type. The storytelling feels detached, until the sudden poetry: “After Renee’s recovery from the treatments/She would walk outside/And feel as though the sun/Would make her evaporate.” This film requires some reading to keep up with the story; it’s not just something you can watch in the background if you are at all interested in Jonathan and his mother’s terrible tale. In the horrific narrative, Jonathan grew up in Texas with his mother, Renee LeBlanc. His father abused his mother and left them when Jonathan was young. Renee was diagnosed as schizophrenic when he was small, and she was raped in front of her young son. Jonathan spends years in foster homes where he is tied and beaten. Renee’s parents, Jonathan’s grandparents, have Renee treated in psychiatric hospitals. When Renee recounts her childhood memories late in the film, we hear eerie echoes of Jonathan’s experience, echoes that reveal just how difficult it can be to break cycles of family violence. As Jonathan shares his coming of age and his acceptance of his sexuality he never shies away from revealing himself in the most intimate ways. He seems to find a refuge in front of his own camera. At age 11 in front of his home video camera, Jonathan’s first film featured himself as Shirelle, a junkie, and Hillary, a battered housewife. Jonathan never once breaks character in these raw performances. I recognized in this small mention of a meeting what may have been a flash of inspiration, like a big bang creating a new star, that a mentor can provide for a neophyte who is ready. Perhaps that chat with Robert Stigwood was one of those conversations that saved Jonathan’s life, that gave him a place to put all the emotion and energy he carried around with him. While his hairstyles changed frequently with the times, Jonathan’s creative impulses remained constant throughout his childhood. In addition to filming his life, in high school Jonathan co-wrote a musical version of David Lynch’s Blue Velvet in which all the performers lip synched Marianne Faithfull songs. When I saw that, my heart lightened; I knew Jonathan was going to make it through. After Jonathan calls “every Steve Caouette in the world” to find his father, whom he hasn’t seen since he was two, he finally reaches him. Within the first three minutes of speaking with his son for the first time in about 20 years, Jonathan’s father asks, “Are you gay? You don’t have AIDS, do you? Cause if you have AIDS, I don’t want anything to do with you.” You can feel the kick of his words in your gut, as Jonathan may have felt in his stunned silence. By including this scene in his film, though, he allows us to see how his father is outed as the intolerant one. Jonathan always gives his parents the benefit of the doubt, later filming the reunion of his father, his mother, and himself at his apartment. Things look up for Jonathan when he moves to New York. A year later he’s found acting work, is doing the production of Hair he dreamed of doing as a kid, and has made 17 student films. Then “Renee and Jonathan connected like never before” when his mother came to New York to live with him. His now-brain-damaged mother maintains a simple grace and a foul mouth all at once. She’s at war with herself, bringing up subjects she doesn’t want to talk about. Jonathan shows the spectrum of her moods and intellectual capacity, beautiful in one moment and awful the next. One of my professors said artists should all strive to make the world better with their art, that artists owe it to people to give them something to help them up in their lives. In Tarnation, Jonathan Caouette edited 19 years of his own life into a shape that affirms his love for his scratched and dented family, a gesture of hope and promise standing out from a bleak landscape. We owe Jonathan Caouette our gratitude for discovering how well, and how easily, film can capture the joyful glints of light on life’s surface as well as the terrors of the deep well of tragedy beneath.